It appears that the Russian Cyberattack(whether government or private operatives is unknown – but both likely directed by leaders at the Kremlin) on the 2016 election was far broader than originally reported. A new story breaking today in the major media outlets says that Russian operatives underwent a massive operation to hack at least 39 different state election systems. In Illinois they attempted to wipe out all of the state’s voter data, and in another state they attempted to access the campaign finance database. While the Russian attempts seem more egregious in this recent election, former FBI Director Comey explained last week that there is no evidence that the Russians were actually able to change a single vote or physically alter the election in any concrete way. In fact, the threats were so serious and so numerous that the Obama administration put everything else on the backburner (even the so-called DNC hacks) and focused the Justice Department’s efforts on figuring out what Russia was doing. The Obama administration even attempted to wrest control of state election systems from the states, but they faced stiff opposition across the nation. It wasn’t until after the election that a deal between the federal government and the states was worked out. 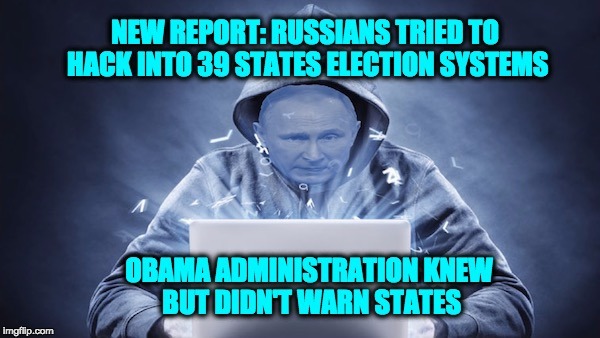 However, while the Obama administration may have been very worried about the Russian hacking… they were apparently not worried enough to warn the states about what was going on. Neither former President Barack Obama nor any member of his cabinet warned state election officials of any Russian effort to hack or interfere with the country’s electoral systems, according to the president of the National Association of Secretaries of State. How worried could the administration have actually been if they wouldn’t even warn the state’s that our elections could be compromised? Was this simply more Obama era incompetence, or did the administration have an ulterior motive in not warning the states? Could the chaos that we’ve seen over the last few months have been exactly what the Obama administration was hoping for?